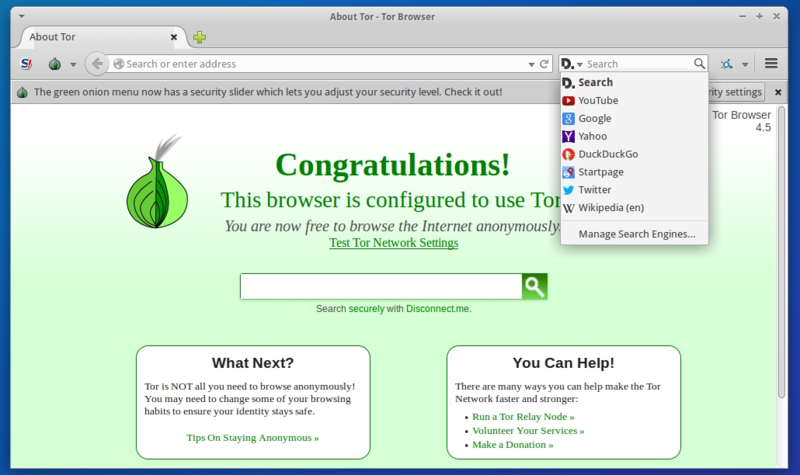 The latest version available is Tor Browser Bundle 4.5, which has been recently released, coming with important changes, including improved usability, bringing a wrapper for launching Tor from the File Manager, the Desktop, the Apps Menu or the command-line, a simplified Tor menu has been implemented, security and privacy enhancements have been implemented and the defaut search provider has been changed to Disconect (which provides private Google search results). In this article I will show you how to install Tor Browser 4.5 on Ubuntu, Linux Mint, Elementary OS, Pinguy OS, LXLE, Deepin, Linux Lite, Peppermint, Debian, Kwheezy, SparkyLinux, Fedora, CentOS, OpenSUSE, Mageia, OpenMandriva, Arch Linux and Manjaro. Because Tor Browser Bundle 4.5 is not available via any repository yet, we have to download Tor from the project’s site, extract the archive, move to /opt and alias the launcher.